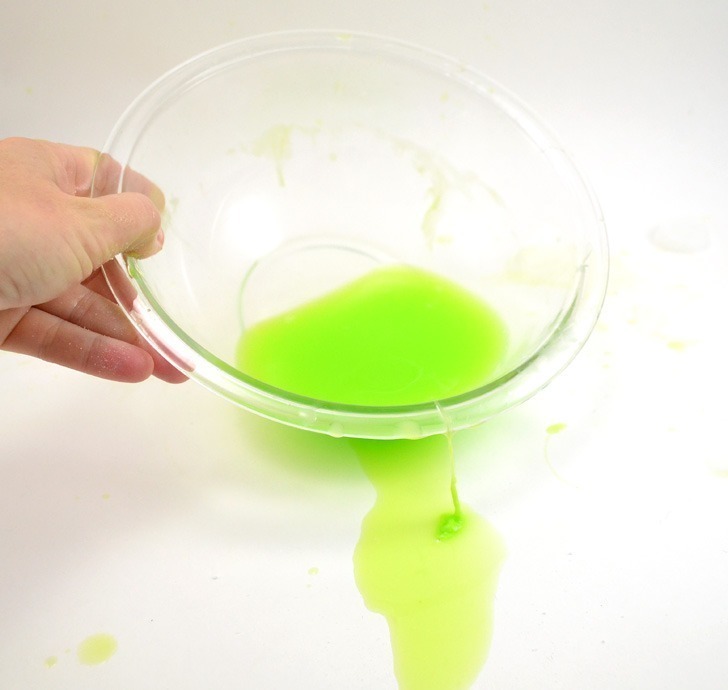 Who doesn’t like playing with slime? It’s fun stuff. It’s kind of grody but super awesome at the same time. 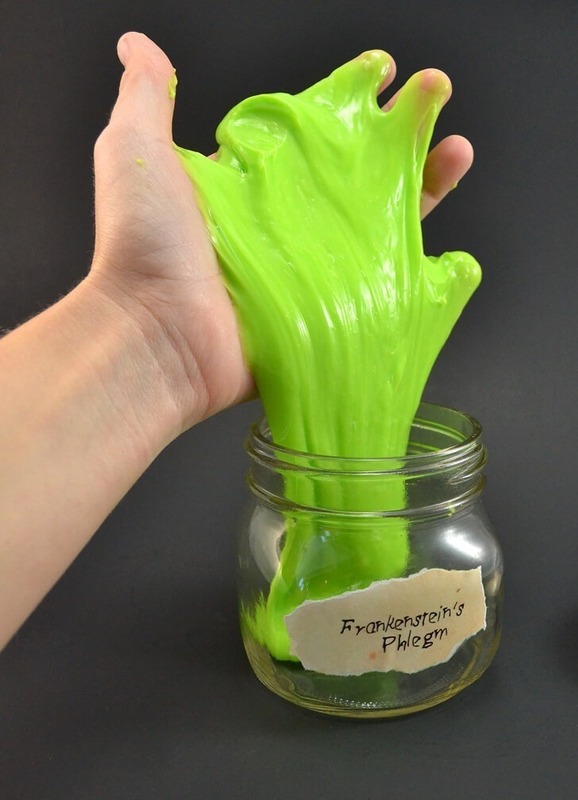 It slips through your fingers and contorts to all sorts of interesting, goopy shapes. I don’t care if you’re a kid or not, if you’ve not played with this stuff you’re missing out. I remember getting similar stuff as a kid. They were made by Nickelodeon back then and I remember it being kind of a pricey thing. I want to say like $6-7 for a little tub but perhaps my memory isn’t accurate on that one! 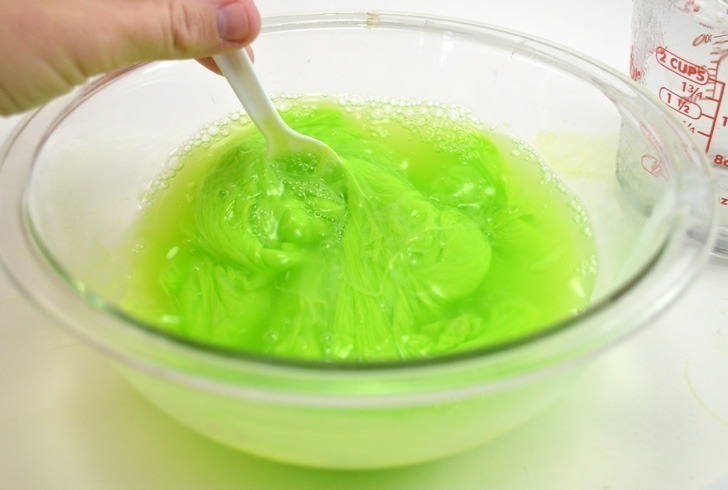 In the end a brand new little cup of slime, be it pink or green or any other color under the rainbow, eventually got filled with little short Boston terrier hairs and lint and all sorts of gunk that made it too grody to actually play with. 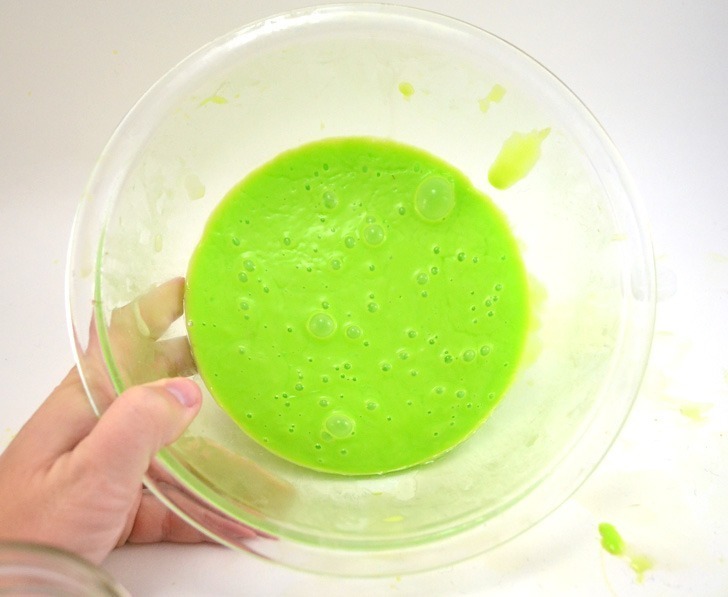 At any rate, let’s rock out this homemade no fail slime recipe, shall we? I’ve tried using discount glue and I haven’t had success. I can ONLY recommend Elmer’s glue because it’s all I have found that has worked for me. 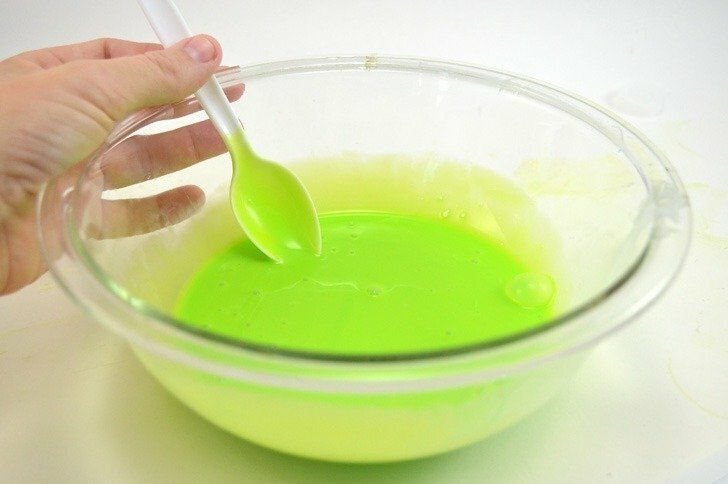 Empty the entire 4 ounces of glue into a bowl or a measuring cup. 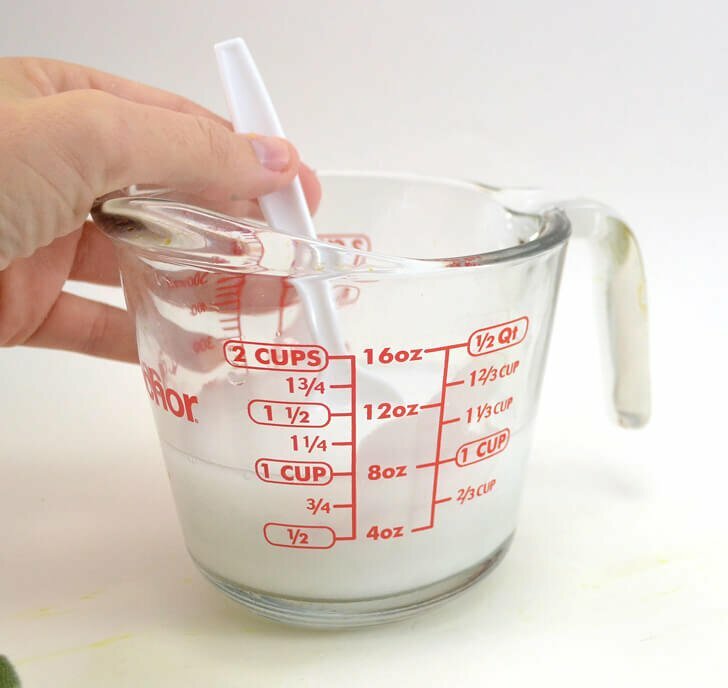 If you have a crafts only measuring cup that’s awesome and if you craft enough I totally recommend it. 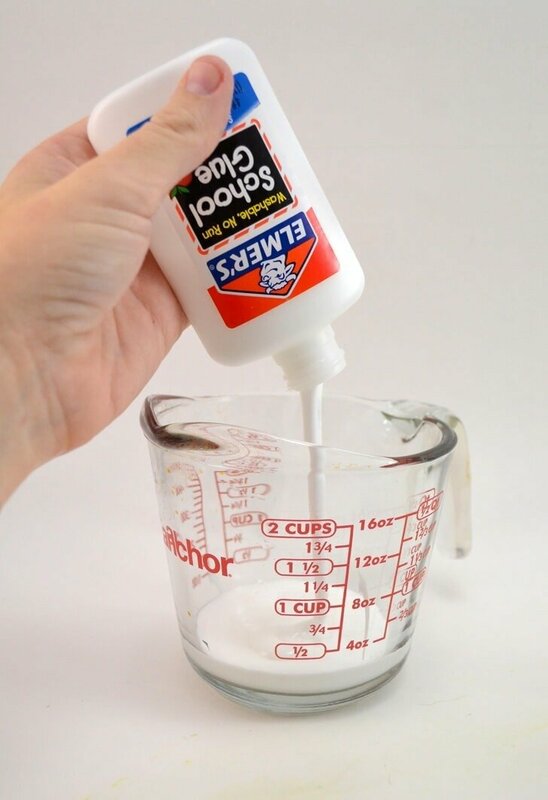 Fill your glue bottle up with water (4 ounces) and pour into your glue. Mix together well. 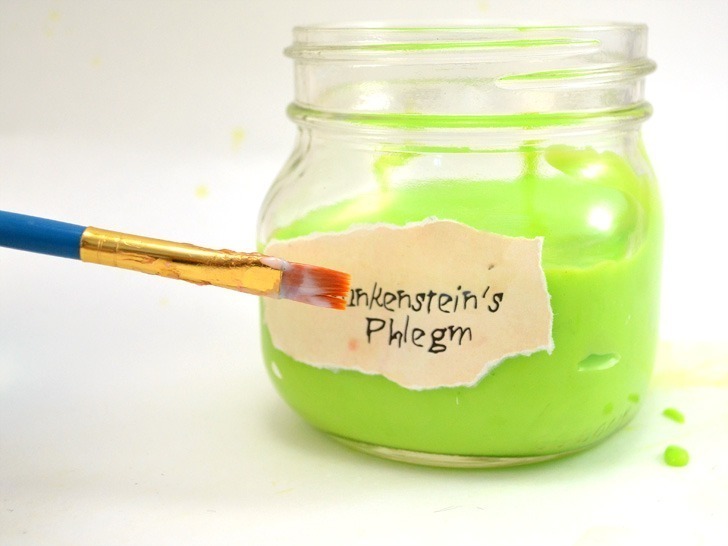 Add your coloring to the perfect phlegm hue (we used about 6 drops of yellow and 1 green) and mix well. 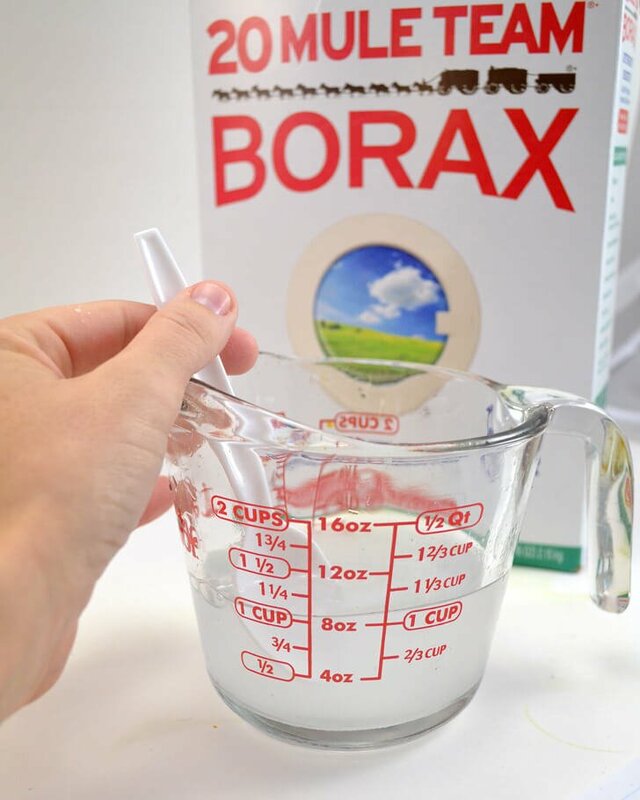 Mix together 8 ounces (1 cup) of water and 1 teaspoon of Borax SEPARATELY. 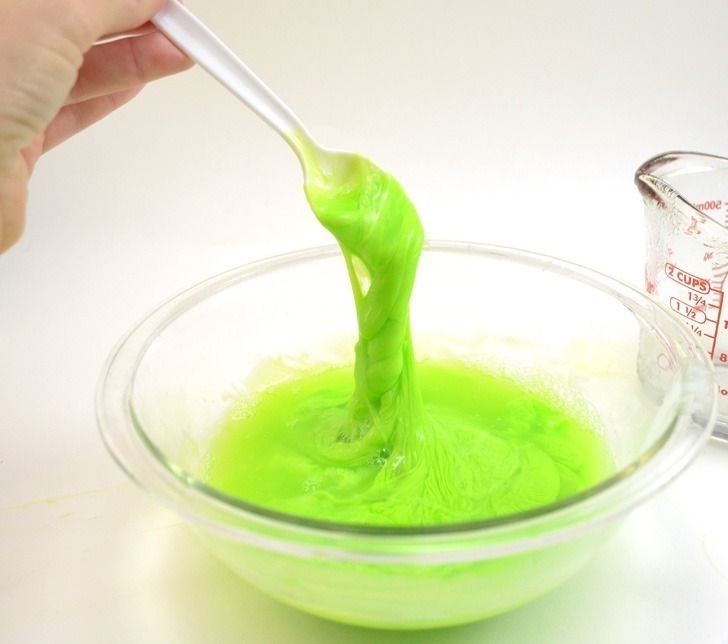 Slowly pour the borax solution into the glue mixture while stirring. You’ll see the texture taking shape right in your eyes. It will look kind of stringy at first and then it will get lumpier and take up more of the water solution in the bowl. At a certain point the slime won’t take on any more of the water. Remove your globe from the water after it seems to quit taking it on. YOU WILL HAVE EXCESS WATER THAT YOU NEED TO POUR OFF. 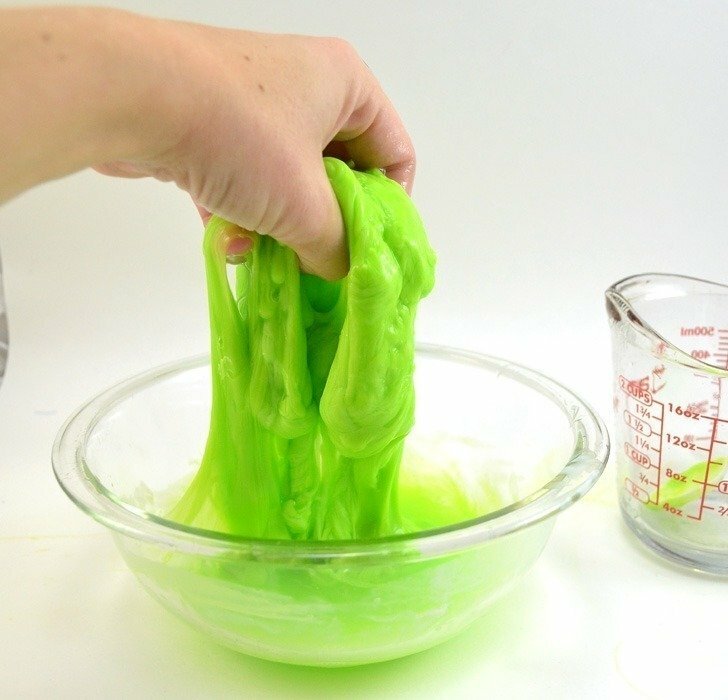 I’m saying that in caps because the first time I tried to make slime I desperately tried to get all of the water to work into the slime. Why else would I use a cup of water if it only takes in 3/4 cup? 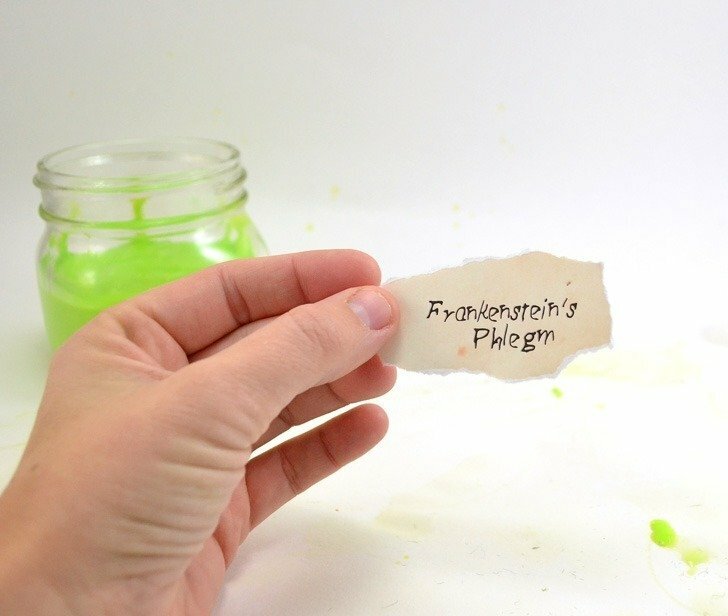 But that’s why… it won’t all get sucked up into the slime. 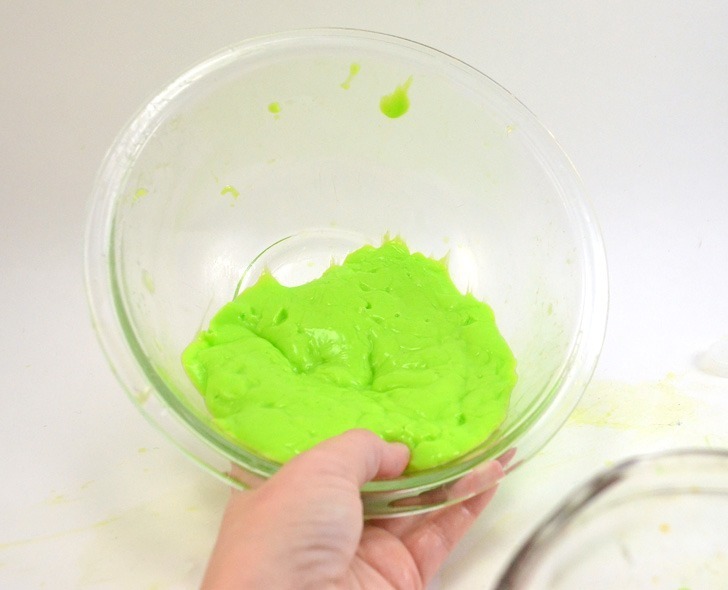 …and come back in about 10 minutes to the perfect texture. Nifty! 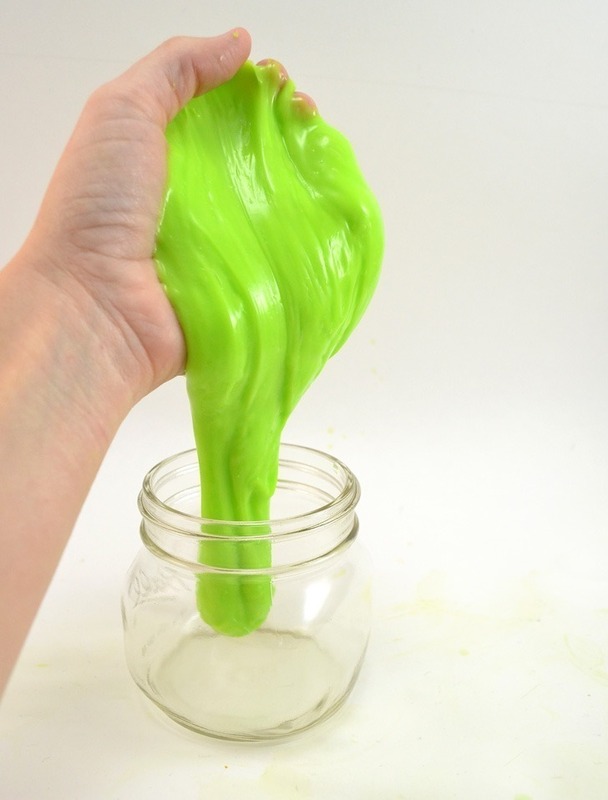 Toss your homemade slime into a jar, vessel or plastic tub to keep it fresh. …and tear out your words. I used a presentation paper that isn’t as thick as card stock but not as thin as printer paper and it is fab. I’ve purchased the HP brand of presentation paper for around $10 for 100 sheets and it’s the perfect crafting paper for reals. 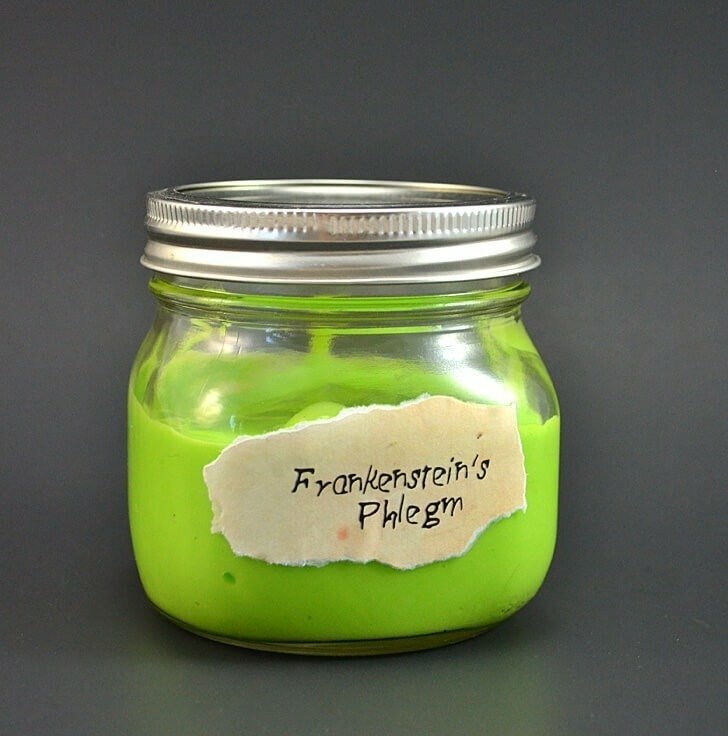 Glue that business onto your jar, I used Dishwasher Safe Mod Podge so that it will last grody hands and wet conditions for longer, and seal it off with a top coat. Isn’t that so cute? If you can round up some baby food jars you can make a super inexpensive and fun little party favor. 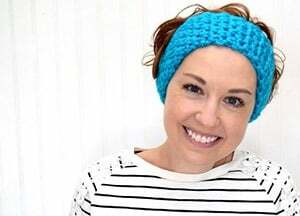 Or if you’re looking for the perfect craft to keep the kiddos busy since they’re surely be wigging out ALL DAY LONG on Saturday wanting to go trick or treating this will keep them busy for quite some time!